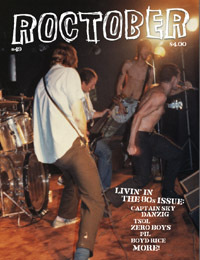 Another action-packed issue of the rag tag Roctoberzine. Comics by John Porcellino, King Merinuk, Rob Syers. Craploads of reviews and interviews. Jake interviews his long-time musical hero Glenn Danzig and tries his best not to annoy the Devil-Locked One. (Glenn’s publicist warns Jake in advance not to bring up the Misfits, or try to be funny and to exceed fifteen minutes. Does he comply with these wishes? Find out.) Jake also talks to Zero Boy’s Paul Mahern who walks Jake through each track of their blisteringly awesome 1982 record Vicious Circle. AND, if all that wasn’t enough, we get us some Nardwuar. Love me some Nardwaur. AND, if a dose of the Human Serviette isn’t enough, the interviewee is no less than the iconic John Lydon! Also included in #49 are articles, interviews, updates and columns by the likes Gentlemen John Battles and Larry Pig Gold. In summation, to quote former Governor Roddy B: "I got this thing and it's effing golden".